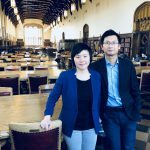 Chunbei Wang and Le Wang of the University of Oklahoma received the 2018 Kuznets Prize for their article “Knot yet: Minimum marriage age law, marriage delay, and earnings,” which was published in the Journal of Population Economics (2017), 30(3), pp. 771-804. The annual prize honors the best article published in the Journal of Population Economics. Period 1998–2000: David C. Ribar (The George Washington University), for his article “The socioeconomic consequences of young women’s childbearing: Reconciling disparate evidence”, Journal of Population Economics 12: 547–565.